State police shut the highway down in Franconia Notch around 4 p.m. due to hazardous wind conditions. Lincoln police said the closure included the north and southbound lanes. 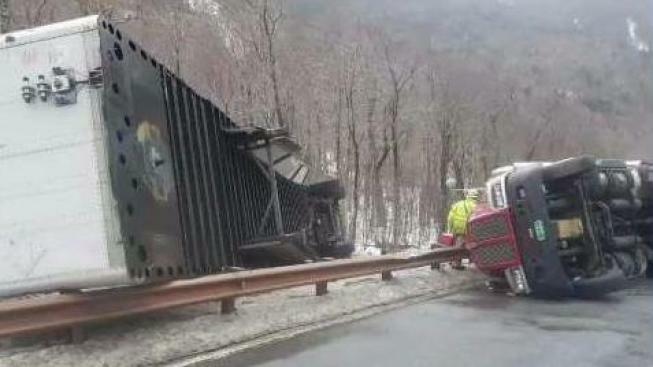 A stretch of Interstate 93 in the White Mountains of New Hampshire was briefly closed after high winds blew three tractor-trailers, right over on Monday afternoon. State police responded just before 2:30 p.m. after reports of two tractor-trailer rollovers. When troopers were dealing with those crashes, a third truck tipped over and landed on a cruiser with a trooper inside. A stretch of the highway was closed, but has since reopened. Police are urging the use of caution in the area. The state Department of Transportation said that there are three trucks rolled over due to the high winds. The guardrails were reportedly heavily damaged. Photos tweeted out by NHDOT showed three tractor trailers on their sides, with one over the guardrail and off the road.